/ What should you do to attract loyal blog readers to your blog? So you blog. Blog readers, also known as the traffic, are the life blood of a blog – the more you get, the better. But not all traffic is created the same. Not all blog readers are the same! There are readers who come to your blog, take a look and leave forever. There are readers who visit your blog, read a few pieces of content, and then leave. There are readers who come to your blog, read your content, take some action – like sharing your blog post, leaving a comment, or signing up for your newsletter and then leave. And, there are readers who come to your blog, do all of the above, but come back again and again for some reason. I call them loyal readers. Loyal readers are the ones who will be “in” your business – you can do business with them. It is because they will be in touch with you and your website; they will have a connection with you – and a rapport. When you have a product or a service to sell, it is only your loyal readers who will be in a position to hear out and take action – not the casual visitors! So, how can you attract loyal readers to your blog? Via a 4 step process. The first step to attracting loyal readers to your blog is to know who your readers are! You can only find loyal readers if you attract the right readers to your blog. So is there someone like a “wrong” reader? Yes! A reader who doesn’t find anything interesting, useful, or anything to relate on your blog is a wrong reader to your blog. “Wrong” in the sense that your blog and that reader are not for each other! For instance, say the reader interested in buying homemade chocolate ended up on your blog somehow – if you try to sell bicycles to that reader that would be ridiculous right? Such a reader is not the right reader for your blog. So you need to find the right audience and then attract them to your blog. If you have clarity about your blog’s topic and the purpose of your business, finding the right audience is a piece of cake. And, while you find the right audience you have to get as precise as you can! “Bloggers” is a bad example. “Mexican food bloggers” is a good example. Once you know your audience it is time to know about their problems and pain points. This step is highly crucial. Only if you know their problems, you can provide useful stuff on your blog that they can find interesting and can relate to. Otherwise, no matter how great is the content you publish, your blog will end up uninteresting and not useful to the “right” audience that visit your blog. If that’s the case, even with great content and with the right audience landing on your blog, you won’t be able to make them “loyal”. Even the right audience will simply leave your blog forever because they have no reason to come back! Finding the problems of your audience is not a complicated thing once you precisely know who your audience are. You just have to hang out where your audience hang out. You can find what their problems, challenges, struggles and interests are by visiting relevant Facebook groups, forums, communities or Q/A sites like Quora. Now we are on step 3. Once the first two steps are done, step #3 is very easy. You just have to provide your readers with what they want. You know your readers, you know their problems. Now start creating blog content that addresses those issues. The content can be informational, tutorial, step-by-step guide, case study, or whatever – as long as it addresses your readers’ issues/interests in a genuine way, you win. If you fill your blog with such content your readers will always come back for more and will stick to you. If you want to know how to create killer content for your business, grab this course! #4 Go the extra mile, treat them special! Providing great, useful content on your blog for your audience is good! But treating them special is great! This is a crucial step to make them remember you and stick with you. And this step will make your readers talk about you – that is word of mouth marketing. If they find extraordinary value in the content you provide and if they find that they are being treated special, they will share your content for sure and will be engaged on your site/business. So how can you treat them special? There are quite a few ways to do it! Assuming your loyal audience are in your email list, you can provide them with exclusive subscriber-only content via newsletter. You can provide them with exclusive resources like reports, e-books and even access to courses for free – like the one I do (get free access to the Blogging Success Foundation Course and feel special!). You can provide subscriber-only discount on your products or services. For instance, we waive WordPress installation and set up fee for our web-hosting customers. You can do it your way! Treat them special and they will stick with you. 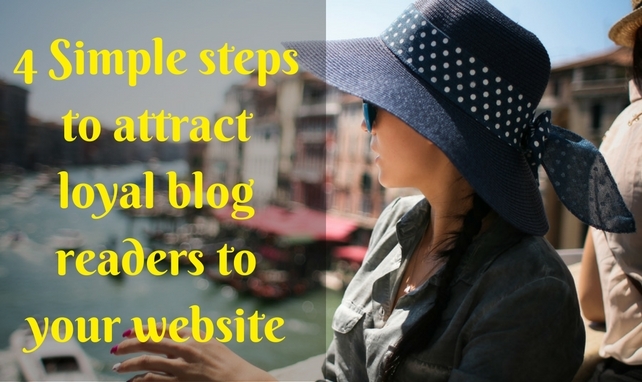 There you go – 4 simple, practical, and working steps to attract loyal readers to your blog. Put this to practice and start reaping the benefits! Knowing who your audience is is vital if you want to get anywhere with your audience. Usually my audience would let me know what topics interest them through the comment section, email, or through a blogging community. With the said you want to stay consistent with the topics you write about based on their interest. If you can do this then you’ll definitely will grow a loyal audience. It is difficult to get loyal readers to our blog. But I do believe the tips that you have shared are good and I will be using them for sure. I certainly believe that to get loyal readers we need to know what they want from our blog, we really need to give what they need and if we are able to fulfill their needs, we will surely be having a good base of loyal readers. Also, focusing on one aspect can help build a good base of readers, which you have explained in your own words. Although it is not an easy task, but as we know good things never come easy. Keep up the good work Jane ! These are the most important and effective tips need to consider to attract more blog readers to your site.